Today we are going to have a look at the PING G15 Hybrid. We recently fell in love with the i15 irons from PING and were excited to check out the newly designed hybrid offering from PING. We figured we would first have a look at the more forgiving G series of hybrid, as well…if we are bagging a hybrid, we want something that will be easier to hit than the 3 iron we had been playing, right? So, as always, a little background info about the clubs and then on to our thoughts on this new hybrid. 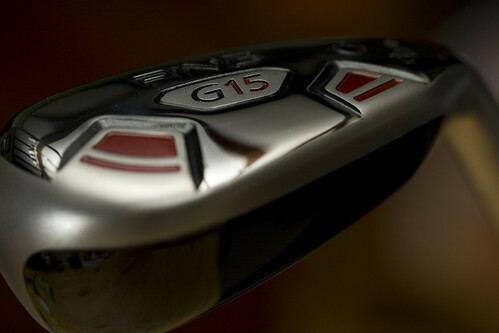 The G15 hybrid is engineered as a high-launching, forgiving alternative to long- and mid-irons. A large internal toe pad expands the perimeter weighting to make it PINGâ€™s most forgiving and longest hybrid ever. The stainless steel hybridâ€™s unique shape features an iron-style face and hosel design which positions the center of gravity closer to the face to increase launch angle and reduce spin. The clean look at address inspires confidence for golfers of all abilities. First thing you will notice when you line this club up at address is the large amount of offset built into the club head. 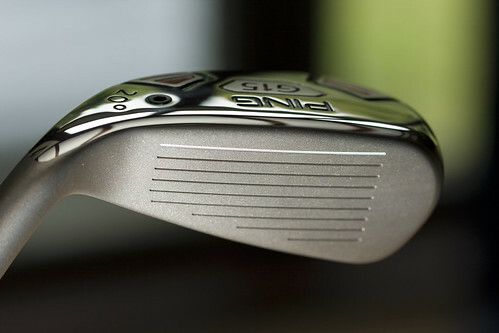 We reviewed a G15 hybrid with 20 degrees of loft, and were surprised by the amount of offset. This is built into most game improvement clubs, and should help the average weekend golfer square up the club face, helping to prevent a slice. Pesonally, I just found it to be distracting, but I have been playing the Adams Idea Pro Gold hybrids most of the season, and those offer little to no offset, and nowhere near the forgiveness or length of this particular hybrid. I generally find people lean one of two ways: they love their fairway woods and that particular shape or they love the look and feel of an iron. Golf equipment manufacturers seem to understand this as well and generally seem to build hybrids that tip in one of those directions. The PING G15 hybrid definitely falls more on the iron side of the fence. The relatively compact head and sharp face angle are reminiscent of an iron at address. For those of you who have been reluctant to give up the 3 iron because you like that feel in your hand, the PING G15 should appeal to you. If you are the kind of person who likes a 7 wood, you may not be as impressed. Feel wise, the PING G15 hybrid offers up a solid thud at impact and the ball proceeds to launch itself off into the stratosphere, eventually landing way down the fairway. I did not find the feel on off center hits to be as telling as hybrids in the player class of club, but that is to be expected. Hits on the sweet spot did feel nice, not as buttery soft as a well struck 3 iron, but still nice. I could also tell about where on the face any poor swings managed to connect with the ball. Feel was a little clicky on more finesse shots like a bump and run around the green or trying to punch out from under a tree. I did not have confidence with the club to execute those types of shots and just stuck with my irons. The stock shaft fit in the G15 was quite stout and stable at impact. Not nearly as smooth as a Matrix shaft, but, it seemed to do its part in launching the ball high and did not feel too loose. The first few hits I had with this club were phenomenal. They were high, straight as an arrow and as long as any hybrid I have ever hit, if not longer. Then, I hit a hook. And the offset in the club just started bugging me. It became one of those mental things for me…is it the offset? Can I just hold off the release to get it straight? So I went through a series of hooks and pushes trying to get my release back under control, never quite feeling as comfortable with it as I did on those first couple swings. That being said, I put this club in the hands of a golfer that was more accustomed to playing with an offset long iron and he was crushing the ball just like I did on my first few swings. No question, this club is extremely forgiving and long. Workability wise, I was certainly able to hit a hook with the club and even hit a nice little draw with it now and then. I was not able to hit a baby cut with it, however. Was either a push or a hook, that’s about all I could get from it. Now, granted, I am certainly no professional golfer, so your mileage may vary. I also doubt the target audience for this club is looking to work the ball. If you are just looking to be more accurate with your long irons, get rid of those 3 and 4 irons, replace them with something significantly more forgiving like these G15 hybrids. While I may have had some mental issues with this club, if you typically play a straight ball or a little slice and are looking for added forgiveness in your long iron game, put these clubs on your list to demo. Initially I was absolutely crushing the ball with this clubs, long, high, straight, it was awesome. Me, being a mental midget when it pertains to golf, let the offset get to me, and really could not settle in to be comfortable with this club or trust it. Based on how much I loved the i15 irons, I suspect I am a better candidate for the i15 hybrids as well, which offer less offset, more workability and are still quite forgiving. 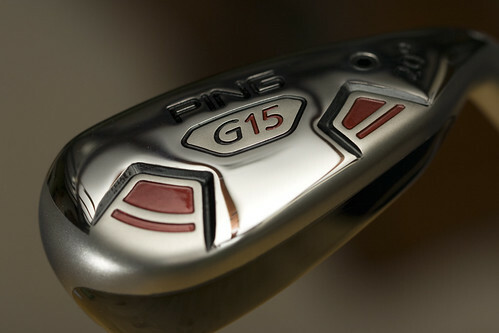 The G15 Hybrid can be found at your local golf retailer for a suggested retail price of $159. 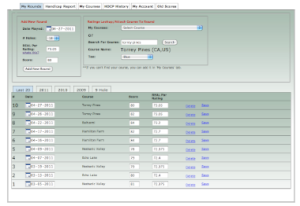 As with all PING clubs, your best route, however, would be to find an authorized PING club fitter in your area. They can set you up with a number of fit options and suggest the best club head or specifications for your swing. As with most of our reviews here, Ping has provided the i15 Irons used in this review free of charge. As we receive equipment from all of the major golf equipment manufacturers, we try to remain unbiased and provide an honest look at every piece of equipment we review at The Deep Rough, this is nothing new. We would have a much harder time putting together all of these reviews if the manufacturers if we had to go out and purchase all of this equipment at retail prices. And for full disclosure, just about every piece of equipment we receive for a review we end up giving away to charity or as prizes in contests. This particular club was given away as a prize in a charity golf tournament for a local high school. It’s a shame you don’t have a donate button! I’d without a doubt donate to this superb blog! I suppose for now i’ll settle for book-marking and adding your RSS feed to my Google account. I look forward to brand new updates and will talk about this blog with my Facebook group. Chat soon!